Researching the Diversity of Knowledge Indigenous Identity and Resistance brings together the work of Indigenous Studies scholars working in Canada, New Zealand and the Pacific in research conversations that transcend the imperial boundaries of the colonial nations in which they are located. Their lucid, accessible, and thought-provoking essays provide a critical understanding of the ways in which Indigenous peoples are rearticulating their histories, knowledges, and the Indigenous self. Edited by Brendan Hokowhitu, Nathalie Kermoal, Chris Andersen, Anna Petersen, Michael Reilly, Isabel Altamirano-Jiménez and Poia Rewi. Winner of the 2012 Willa Literary Award in the area of Scholarly Nonfiction, presented by Women Writing the West. Winner of the 2012 Best Book in Aboriginal History Prize presented by the Canadian Historical Association. Winner of the 2012 award for Best Scholarly and Academic Book presented by the Book Publishers Association of Alberta. Winner of the 2011 Armitage-Jameson Prize presented by the Western History Association and the Coalition for Western Women’s History. The recognition of Indigenous rights and the management of land and resources have always been fraught with complex power relations and conflicting expressions of identity. Indigenous Encounters with Neoliberalism explores how this issue is playing out in two countries very differently marked by neoliberalism's local expressions -- Canada and Mexico. Edited by Roger C.A. Maaka and Chris Andersen. The Indigenous Experience: Global Perspectives is the first book of its kind. In attempting to present the reader with some of the richness and heterogeneity of Indigenous colonial experiences, the articles featured in this provocative new volume constitute a broad survey of Indigenous Peoples from around the globe. In the first book ever published on Indigenous quantitative methodologies, Maggie Walter and Chris Andersen open up a major new approach to research across the disciplines and applied fields. While qualitative methods have been rigorously critiqued and reformulated, the population statistics relied on by virtually all research on Indigenous peoples continue to be taken for granted as straightforward, transparent numbers. “Precontact” may not be found in everyday conversation, but it describes the period prior to the time that Europeans/Americans first interacted with Native Americans. And it is commonplace in any discussion of Alaska history. A visually stunning survey of Blackfoot war art When the Blackfoot Indians were confined to reservations in the late nineteenth century, their pictographic representations of warfare kept alive the rituals associated with war, which were essential facets of Blackfoot culture. The Fourth Eye brings together Indigenous and non-Indigenous scholars to provide a critical and comprehensive account of the intricate and complex relationship between the media and Māori culture. Examining the Indigenous mediascape, The Fourth Eye shows how Māori filmmakers, actors, and media producers have depicted conflicts over citizenship rights and negotiated the representation of Indigenous people. Directed by Frédéric Boily, with the participation of Charles Bellerose, Anne Boerger, Natalie Boisvert, Nathalie Kermoal and Benoit Mousse. Published by the University press of Laval University. Les événements qui ont touché le Manitoba entre 1850 et 1900 ont engendré une transformation du rôle des femmes dans la société métisse de souche francophone et ont profondément affecté leur vie quotidienne et l’évolution de la société. L’objet de ce livre n’est pas simplement de mieux comprendre le rôle des femmes dans l’économie métisse, mais de situer le langage gestuel. En scrutant ainsi le détail, nous pouvons valoriser l’expérience directe des individus et des communautés et, plus particulièrement, rehausser la contribution unique des Métisses. We like to be free in this country The story of the expansion of European civilization into the wilderness continues to shape perceptions of how Aboriginal people became part of nations such as Canada. This groundbreaking study subverts this narrative of progress and modernity by examining Canadian nation building from the perspective of a northern community and its residents. In The Spirit of the Alberta Indian Treaties Price argues that current difficulties in the interpretation of Alberta's Indian treaties result largely from fundamentally different perceptions of Natives and government representatives as to their meaning. Winner of the 1992 Educational Title of the Year, Alberta Book Awards...This book raises awareness about the historical agreements between Aboriginal First Nations and the British Crown. Section I contains chapters entitled: "Historical Background," "Treaty Relationships," "Northern Treaties - Treaty Eight Case Study," and "Historical Overview." As Their Natural Resources Fail 2002 Recipient of the Aboriginal Justice Award. In As Their Natural Resources Fail, Tough examines the role of Native peoples, both Indian and Metis, in the economy of northern Manitoba from Treaty 1 to the Depression. He argues that they did not become economically obsolete but rather played an important role in the transitional era between the mercantile fur trade and the emerging industrial economy of the mid-twentieth century. Tough reconstructs the traditional economy of the dynamic fur trade era and examines its evolution through reserve selection and settlement, scrip distribution and the participation of Natives in the new resource industries of commercial fishing, transportation, lumbering, and mining. His analysis clearly shows that Native people in northern Manitoba responded to the challenge of an expanding market economy in rational and enterprising ways, but that they were repeatedly obstructed by government policy. Numerous interpretive maps, figures, and illustrations provide indispensible aids to Tough's argument. His book will be essential reading for anyone interested in the history of western Canada and the role of Native people in the post-fur trade era. 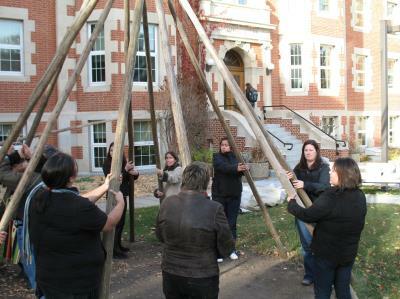 A comprehensive history of treaty-making in Saskatchewan. Bounty and Benevolence draws on a wide range of documentary sources to provide a rich and complex interpretation of the process that led to these historic agreements. The authors explain the changing economic and political realities of western Canada during the nineteenth and early twentieth centuries and show how the Saskatchewan treaties were shaped by long-standing diplomatic and economic understandings between First Nations and the Hudson's Bay Company. Bounty and Benevolence also illustrates how these same forces created some of the misunderstandings and disputes that arose between the First Nations and government officials regarding the interpretation and implementation of the accords. Dr, Tough co-authored this book with Dr. Arthur J. Ray, a professor of history at the University of British Columbia, and Jim Miller, a professor of history at the University of Saskatchewan. While the history and culture of western Canadian Indians in the nineteenth century has been well documented, little has been published concerning their experiences in the more recent period. To understand the Indians of today one must know more about their history in the twentieth century. Dempsey's study of the participation of more than 400 western Canadian Indians in World War I offers a unique opportunity to view their society one generation after the signing of the treaties. They had been confined to reserves for thirty years, living in poverty under an oppressively paternalistic regime, yet they enlisted in numbers comparative to other Canadians, and acquitted themselves with honour. Surviving evidence indicates that the Indians of the prairie provinces enlisted for three principal reasons: the survival of a warrior's philosophy or ethic; the existence of a loyalty to the British Crown; and the opportunity to escape the stagnant life on the reserve. Northern Alberta has been homeland for Aboriginal peoples for thousands of years. Its post-contact history exemplifies themes common in Canadian history: the advent of the fur trade, the arrival of the European missionaries, the expansion of the Canadian State, agricultural land development, and modern transportation and communication systems. Edited by McCormack with R.G. Ironside, this volume focuses on the archaeology, fur trade, economics, culture and record of human settlement. 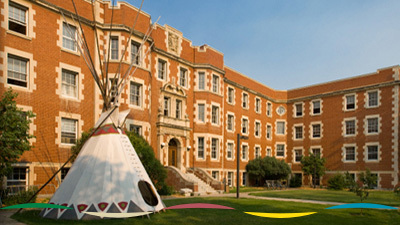 Dr. McCormack's work regarding the prevelance of Indian stereotypes has also been featured in the University of Alberta publications: Folio Magazine "Dances with Wolves R [not] Us" Images of Indian-ness: Popular Culture, Native Realities Express News "Blackfoot Barrel Racing Barbie carries a message"
Professor Anderson wrote the chapter entitled:"The Formalization of Métis Identities in the Canadian Courts" in Expressions in Canadian Native Studies. Saskatoon, SK: University of Saskatchewan, Faculty of Extension Press (2000). "Aboriginal Justice: Constructing Responsible Individuals and Communities Through Restorative Justice" in Crime, Law and Social Change. (1999) 31:303-326.